37 usd for 3 light tanks? That's nuts. Peter Pig sells them for 5£ which is 6.40 or so US. The FOW set comes with decals and unit card. A lot of people feel that the quality of the FoW vehicles is superior to the PP models. RMMV. 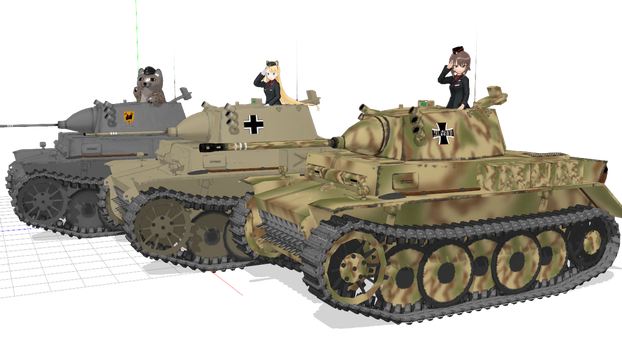 The PzII Luchs is my favorite light tank. What a cute little tankette. Yeah, tanks and cute go together like vegemite and toast! A lot of people feel that the quality of the FoW vehicles is superior to the PP models. RMMV. FoW are market leaders in price only. A) There not plastic, resin an white metal. B) There also old molds so detail has dropped off. All battlefront is doing in between new plastics is reboxing older models, going from single blisters to multiples in a box. Battlefront, like others, aren't going anywhere due to 3D printing. People like me who buy quality over quantity find the poor quality of 3D printed tanks to be atrocious. You can keep your print lines. It's nice that dude printed his army for $60 USD but he also had to buy a $450 USD printer for a total of $510 USD which is 2-4 times the cost of a typical 1500 point FoW army. Now if you want your stuff to actually look good you'll need to drop $3.5 USDk-$5k on a professional printer AND on top of that you'll need to hunt down all these 3D files which aren't always free and very rarely high quality (at free price point). In summation, miniature companies will be around long after everyone in my generation is dead. Eventually they may stop selling miniatures but by that point I'm sure they'll start selling 3D files. Winston Smith, I'm with you on this one, Over-priced. I find their declaration a year ago that no more books are to be produced to make people have to buy nation cards for late war for each side deplorable. I knew they would make more books. Now they create theatre campaign books as well as more card sets for each side in each campaign. I suggest move toward a better set of rules Battle Group. Omnijackal, there are no lines on his resin prints, only on the FDM ones he posted for comparison, and the cost of the printer gets amortised over each army so at $60 USD per FOW army, after 2 armies, you're ahead. guys.. apples oranges peacocks T-34's. In other words you're all dancing around the same topic and no so well at that. The POINT is, ALL this technology is leading ALL of us to conclude what we have known ALL ALONG. a. plastic injection molding process is superior to any other method. period. b. metal casting makes vehicles look… "odd"
c. a wall is better than a poured liquid (or erased substrate). f. the investigation and trial and error and spending to get an answer will continue until the Bill Gates of 3D printing reveals him or her self to the world. When that happens, entire regiments of infantry will be printed in one piece hopefully in 1/72 scale at that. When that happens, all of us will have our own printers and all the miniature making companies will be bye-bye. This is also true of the first person to make a viable 3D printed Pine, Coniferous and Diciduous tree. Whomever does THAT WINS and we can all get rid of the totally stupid railroad hobby trees. g. https://www.speira.net LOOK AT WHAT THIS GUY IS DOING and you will see your future. h. so yes the clock is ticking but for now, it is a really big clock.